Venezuelan Attorney General also requested international support for the extradition of several Venezuelans linked to the attack. 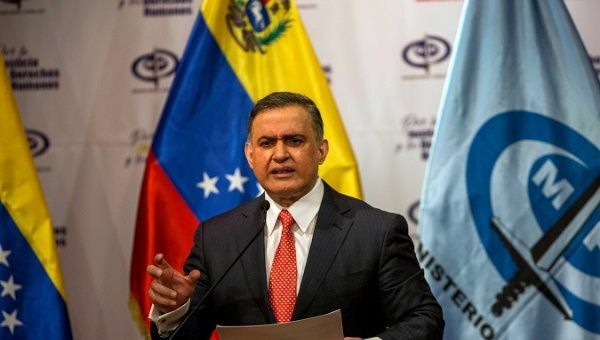 August 23 (teleSUR) Venezuelan Attorney General, Tarek William Saab, announced there are now 43 persons linked to the failed assassination attempt against president Nicolas Maduro after investigations and testimony implicated four more persons to the attack. On August 4, during the Bolivarian National Armed Forces 81st-anniversary celebrations, two drones packed with C4 exploded while Maduro was delivering a speech, injuring seven military personnel. Saab said on August 19 they seven people (Alfredo Guerrero, Ivan Arcay, Elisa Martinez, Maydelen Da Silva, Cono Sapiensa Garcia, Luceidy Mina, and Hector Hernandez) involved in planning and executing the attack were taken before national authorities, and Wednesday four more were presented by the General Attorney’s Office. The persons involved in the attack are Yonathan Medina, Thais Valera, Andrea Rivas, and Eugenio Escalona. So far 25 people are being investigated, while the government has requested 18 Interpol red notices for the arrest and extradition of people who participated in the failed assassination attempt and who are currently residing in Colombia, Peru, and the United States. Saab emphasized the state has been able to identify the material authors, as well as the people who provided economic and logistical support. Authorities have recently searched nine homes and offices. Venezuela has requested the support of other countries to deport people involved in the attack and to help Venezuela in their fight against terrorism. The Venezuelan government has requested Colombia to extradite opposition legislator Julio Borges, retired colonel Oswaldo Garcia, Gregorio Yaguas, and Yilbert Escalona, all of whom are implicated in the attack. The government has also requested the extradition of Rayder Russo Marquez, Osman Delgado Tabosky, Carlos Aular Monastery, Virginia Da Silva-Pio, Elvis Rivas Barrios, and Josser Lopez Valero.